Night is over. Dawn clocks in. While the crow of a rooster is symbolic of the start of a new day, here it serves a dual purpose, announcing a secondary arrival. In with the dawn, a new genre of music peeks over the horizon. The ambient house movement is upon us. Even the most potent, hyperkinetic rave cannot hope to outdistance the morning sun. What goes up must come down. Euphoria, that means you too, sister. But this is where it gets tricky. Atmospheric reentry is a wildly unstable process. Fallback is too fast. Although air particles create a much needed buffer of friction that curbs speeds considerably, the resulting blessing of drag is not without consequence and a new problem catapults into the mix. Three thousand degrees Fahrenheit of blazing heat engulfs the falling object. Necessity remains the mother of invention. A solution to the problem of reentry heat was born through science with the aid of H. Julian Allen’s blunt body theory. When traveling at high speeds, a sphere cone with a blunt body design at the front of a vehicle is used to trigger an inverse shock wave that pushes heat away from the reentering object. Additionally, a thermal protection system is implemented to protect the remainder of the aircraft. Which brings us full circle, back to the throbbing pulse of the rave. Here, to keep things cool and to ensure maximum hydration, the dancing mob consumes healthy amounts of H20 early and often. While this is all good and fine, there routinely comes a time right around dawn when water is simply not enough. After the frenzy of all-night flight, the heated bodies need something more to help them travel safely through the burning portal of atmospheric reentry so that they can land safely back down on planet Earth. The ambient house movement provided the perfect go-between. 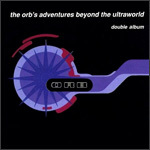 If it was the raver’s heat shield then The Orb’s Adventures Beyond the Ultraworld was its prototype. One small step for man, one giant leap for music.